The safest tip for outfit creation is to limit volume to either your top half or your bottom half, not both. You may even have a floral A-line midi-skirt from a previous era. Great. However, do make sure you style it in a contemporary way. An emerging styling trend is to fully tuck-in tops. This can help to control volume and create shape within an outfit. However, this technique looks best if you have a defined waist and your tummy isn't too large. Using a half or partial tuck still looks contemporary and may work better for you than a fully tucked-in top. Floral prints remain as a major trend this Autumn and Winter season. In particular, statement florals on dark backgrounds. The dominant trend in dresses is for flowy, feminine styles in midi and maxi lengths. Styles include fit-and-flare dresses (great if you have a defined waist); wrap styles; and there are some slip dresses available (add suitable shaping underwear and perhaps a top with semi-opaque sleeves, or a tee shirt). There are fewer options for straighter shapes and all-over volume -- make sure the colour or pattern of these looks contemporary, to keep your look current. It's good to see an increasing variety of styles, lengths, colours and patterns available for skirts. There are still pencil skirts available, if that's your preference for work. However, there are also a range of styles that allow for more movement, and work for larger hips, and in more casual environments, such as floaty, subtle-A-line styles. 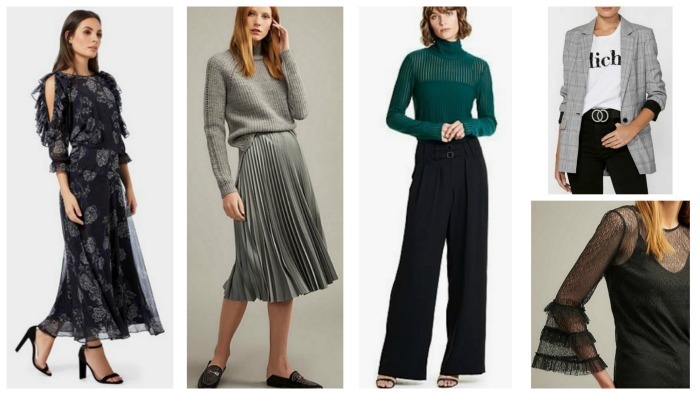 If you haven't added a new skirt to your wardrobe for a while, this is a good time to do so. Pants continue to be easy to find in a wide variety of widths. It will be easier to find full length styles as well as cropped styles, this season. Wider legs styles are the main emerging trend. This includes a few culotte options. However, there's no need to throw out your slim and skinny pants! And these styles are still available to buy. Look for pants in dark floral prints, if you like florals. Statement sleeves. 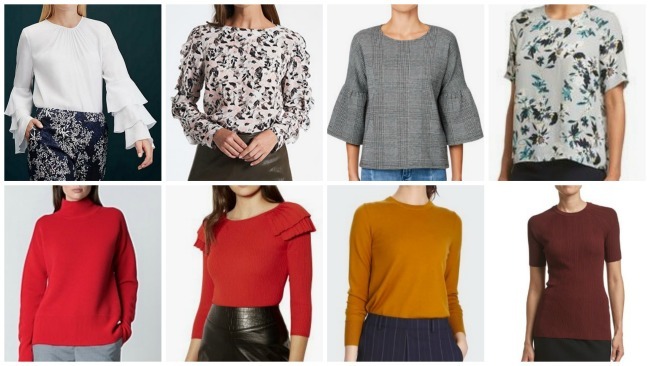 Look for: flared sleeves; ruffles on sleeves; and wide sleeves. Boxy tops. For most women these will need some styling to make them work. For example: a partial tuck at the hem; use a scarf or long-line necklace to create strong horizontal or diagonal lines. Experiment to see what works for you. High, round necklines are dominant this season. If you prefer scooped or v-neckline styles use a scarf or necklace to give the illusion of the shape you prefer! 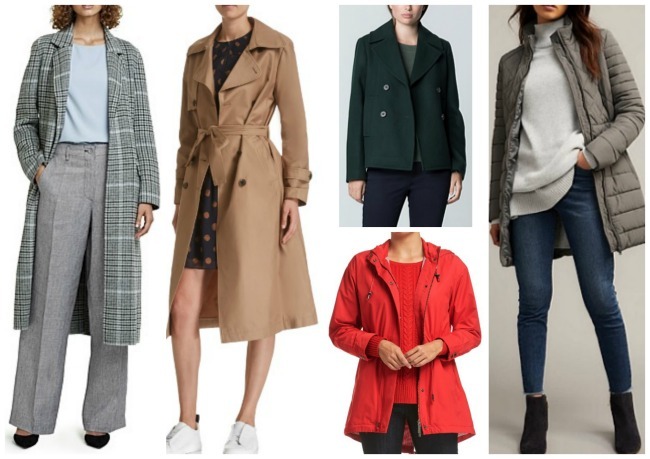 Jackets remain the dominant trend in outer wear. 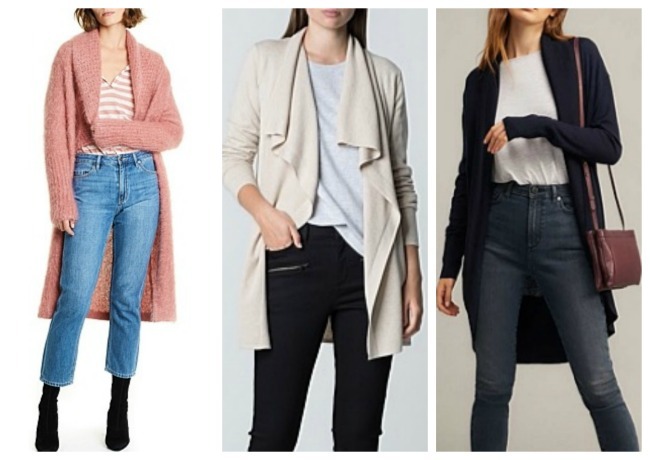 These 4 styles are the main styles this season: blazers (single-breasted and double-breasted styles); denim jackets; leather biker jackets; bomber jackets. For the last few seasons denim jackets have been widely available in a variety of denim blue shades and white (I'm still waiting for an olive green, or brown version!). The main length has been shorter (waist to high-hip length), this season there are also a few longer, crotch length styles available as well. 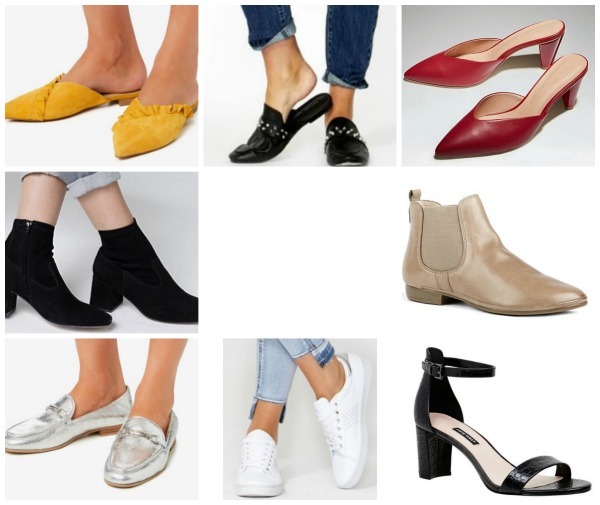 It's so good to see so many stylish low and mid-heel shoe and boot options again this season! Sneakers. White sneakers are still a main trend -- look for small embelishments added, such as studs and florals -- as are fashion sneakers in general. To add height look for platform options. Stretch ankle boots -- with long rises (useful for wearing with cropped pants and midi skirts). I'm seeing block and stiletto heel options (and hoping they become available in a low heel soon!). I've collected a few examples of the other main accessory trends (earrings, necklaces, scarves etc) in my Pinterest board of Autumn Winter Fashion Trends. See them here. If you're feeling bold try combining a subtle check with a bold floral in one outfit! Link the 2 by choosing patterns with similar colours. Or, if you're slightly intimidated by patterns, try adding a floral or checked scarf to your outfit. Neutrals this season include black and navy. There are also some greysavailable. I'm so pleased to see navy continuing as a more universally flattering neutral! There are also some purple berry and plum tones available.